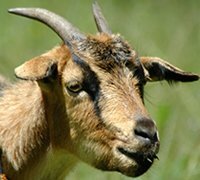 Verm-X Pellets for Sheep, Goats and Alpaca are a natural way to control parasites in your animals. We stock the full range of products in our shop. A parasite control solution for stock on small holdings and farms following organic protocols, Verm-X have developed Verm-X pellets for Sheep, Goats and Alpacas. The Pellets are a natural blend of quality ingredients including the Verm-X herbal stock formula which will control and repel all known internal parasites. Verm-X’s success was recognised in both 2004 and again this year, 2006 when Verm-X has been awarded a Green Apple Award, a Government Supported award scheme to reward products and industries for Environmental Best Practice. Verm-X Pellets are designed to mix well into standard feeds or corn being 2mm in diameter. Produced under licence by Gro-Well Feeds Limited from Wiltshire, they bring over 35 years of feed production experience. All ingredients are natural and non-GM and production is in one of the UK's only low temperature pelleting facilities to prevent any damage to the ingredients. Feed 10g per head (10g scoop enclosed in each packet) per day in feed for seven consecutive days – repeat every 4 weeks.